Home Home Server Guide: Install Docker on Windows 7, 8, and 10 using Docker Toolbox? 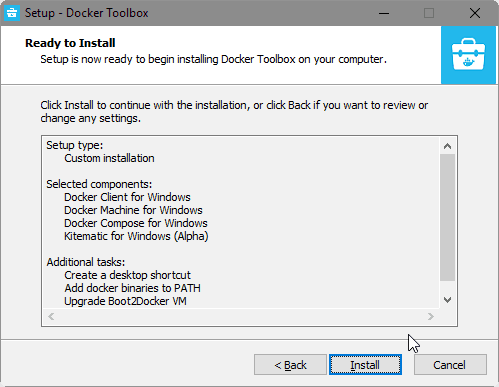 In this guide, I will explain how to install Docker on Windows 7 and 8 using Docker Toolbox. This guide should also work on Win 10 32-bit, non-Pro, or non-Ent editions. Docker, if you do not know yet, self-contains apps, making them extremely easy to install and manage. Home Sever apps such as SickRage, Sonarr, CouchPotato, Plex, etc. can be installed in just seconds. Interesting? Read our guide on what is docker and how it is different from VirtualBox for more information on what it can do for you. We have already covered Docker setup on Ubuntu and Windows 10 64-bit Pro and Ent. What if you have Win 10 Home? Or even Windows 7 or 8. Or what if you have VirtualBox installed on your 64-bit Win 10 Pro/Ent (installing docker would make VMs inoperable)? Fear not, in this Docker Windows guide, we will see how to install Docker for Windows 7 & 8 (all editions) and 10 (32-bit or non-Pro or non-Ent) using Docker Toolbox. This is also the guide to follow if you have Win 10 64-bit Pro or Ent and would like to keep using VirtualBox for running other VMs. For simplicity all references of Windows 10 beyond this point in this guide refer to all 32-bit editions and 64-bit non-Pro or non-Ent editions. All other versions of Windows 10 already have Hyper-V and therefore docker can be installed natively instead of with Docker Toolbox. Windows 7, 8, and some editions of Windows 10 do not have Hyper-V. Docker will not function properly on these systems. But you can install Docker using Docker Toolbox. Setting up docker using Docker Toolbox does not make Docker run natively on Windows. Instead, it uses what is called a docker-machine to create a virtual machine (VM) on VirtualBox. 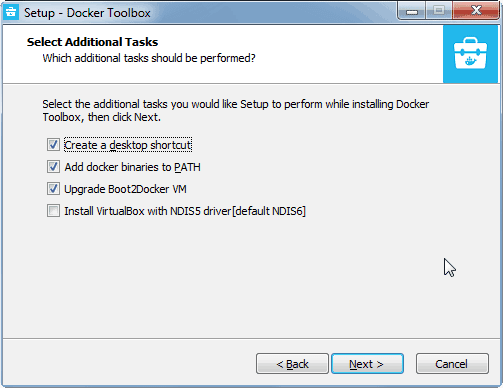 Therefore, if you do not have VirtualBox, Docker Toolbox automatically installs it for you. You do not have to mess with VirtualBox. Docker Toolbox automatically creates a Linux VM on VirtualBox that hosts Docker on your Windows system. Pretty cool right? Let's move on and see how to install Docker on Windows 7, 8, and 10 with VirtualBox enabled. To install Docker using Docker Toolbox, first visit Docker Toolbox download page and download the latest installer as shown in the picture below. 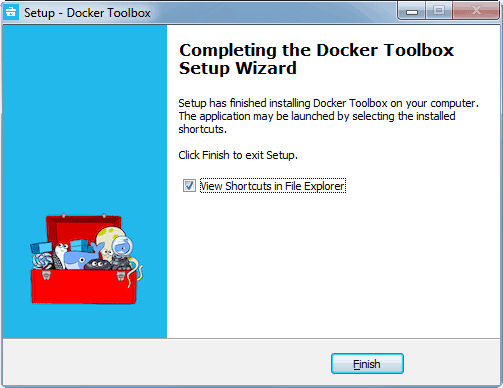 Once downloaded, double click to run the Docker Toolbox installer. 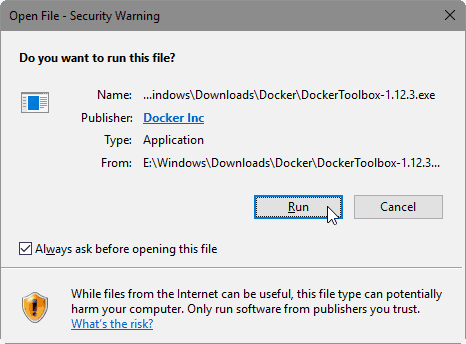 When Windows security warning appears, click “Run” to continue with Docker Toolbox setup. Next, you will have to choose the Docker components to install. Choose “Full Installation” – All of the components will be checked as shown below. Notice that VirtualBox is pre-checked. Without native hypervisor support, Docker needs VirtualBox to run in the background. Don't worry, you won't have to open VirtualBox or do anything on it. Kitematic is an awesome GUI frontend of Docker engine that makes it easy to install and manage containers. More information on Kitematic will be published shortly but it is quite easy to navigate, search, and install containers of apps such as Plex, Sonarr, CouchPotato, etc. Then, you will have to choose additional tasks to perform during installation. Here again, leave the defaults on unless you know what you are doing. Finally, you may review the installation summary and click “Install” to setup Docker on Windows 7, 8, and 10 using Docker Toolbox. When the Docker Toolbox installation finishes, you will be presented with option to open shortcuts in explorer. 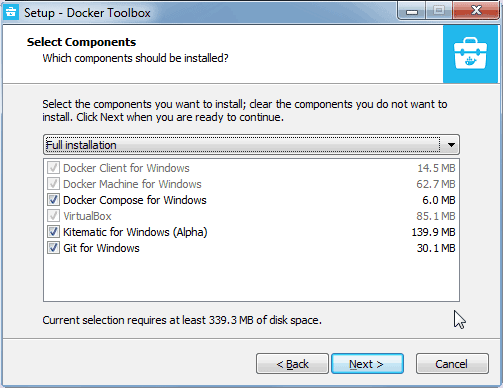 You may also access Docker toolbox components through the Windows apps menu. If you chose to open shortcuts in Explorer at the end of Docker install with Docker Toolbox, you will see the two shortcuts as in the picture below. For newbies and someone who does not prefer commandline, I recommend opening Docker using Kitematic. If starting Kitematic fails, choose “Use VirtualBox” when the option is presented. If you are comfortable accessing Docker through commandline, then open “Docker Quickstart Terminal” (the first icon in the above picture). 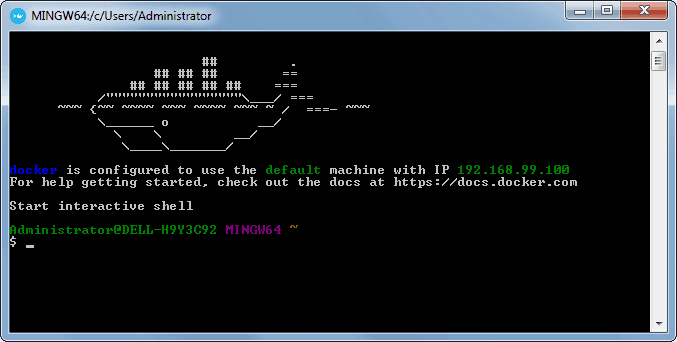 Once Docker terminal starts and appears as shown above, you are good to install any docker containers or images. 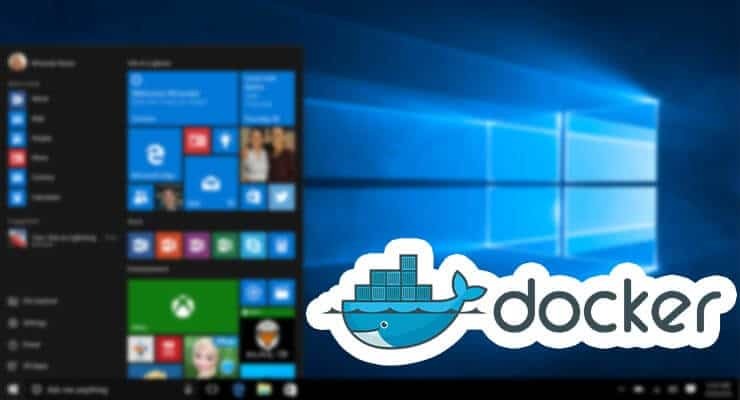 If everything went well, you should have Docker for Windows 7, 8, and 10 is installed, the service should be running and waiting to host containers with various apps. In the upcoming guides, we will show you how to install docker containers with apps (SickRage, Sonarr, CouchPotato, Plex, etc.) to build your home server on docker engine. We will also show you how to use Kitematic to make things even easier. Sounds exciting? Go ahead follow this Docker windows tutorial, install Docker on Windows 7, 8, and 10 using Docker Toolbox and get ready for the ride.